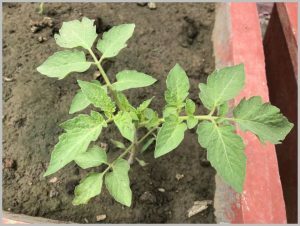 Tomatoes are my favorite thing to grow in a kitchen garden (thought it is technically a fruit). 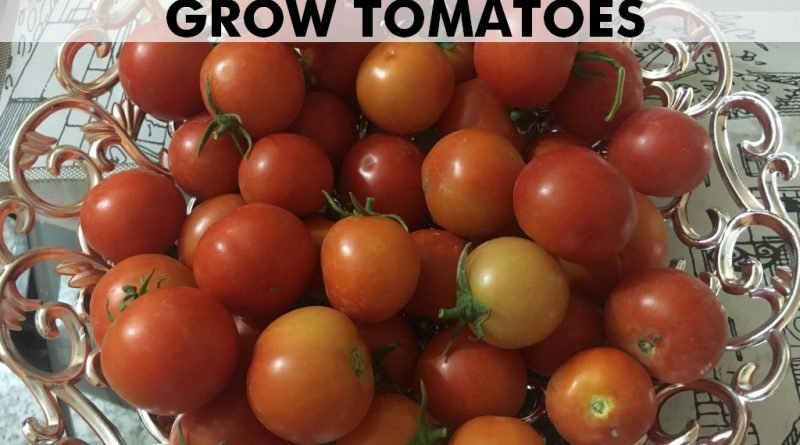 They are easy to start, you don’t need to buy seeds, tomato plants are low maintenance, the fruits are rewarding and they are versatile in the kitchen!! Not to mention, healthy & delicious! 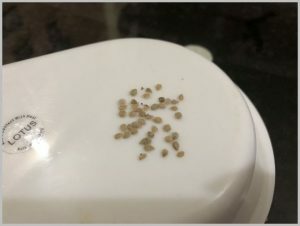 After a few years of experimentation, I have my tomato seed starting down to an art! 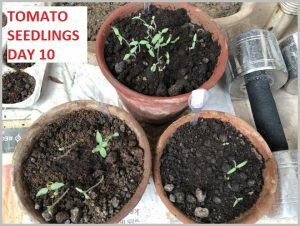 The best part is that there are many ways to grow tomatoes from seeds and you can pick the one you like the most. 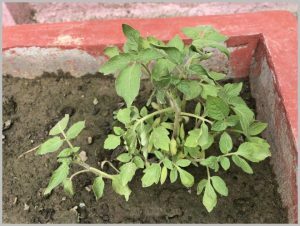 Also, they grow equally well in ground or in containers. Let’s explore! Get the equipment ready. 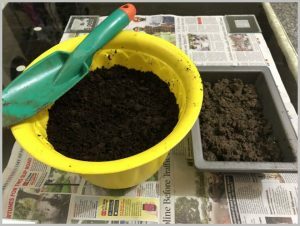 I have taken 3 small terracotta pots and some seed-starting mix – garden soil, compost+coco-peat. 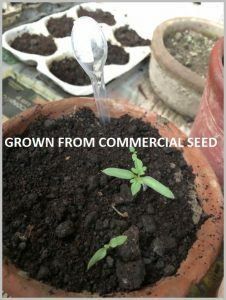 To know more about starting seeds, CLICK HERE. 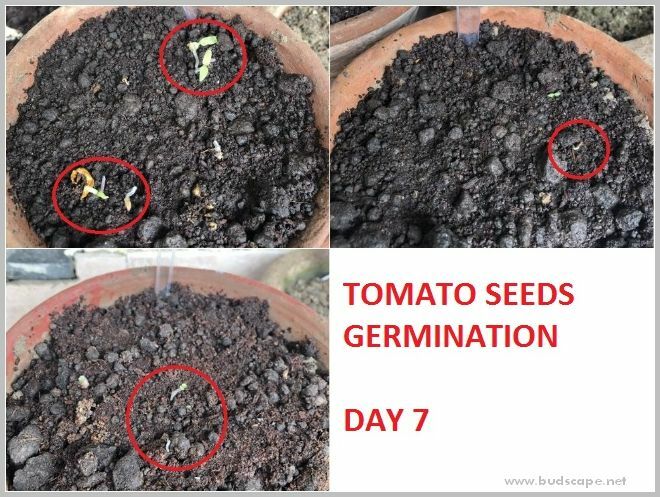 There are 3 ways to get tomato seeds – From tomato pulp, tomato slice & commercial seed packet. For tomato pulp, scoop a tomato from inside and wash the pulp under water while mashing with your hands. You do not need to clean it totally. 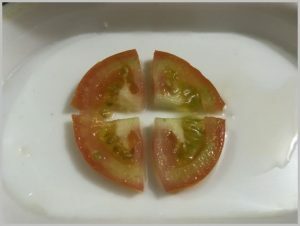 For a tomato slice, take one from the center of a tomato as it has the most seeds. Cut it into 4 pieces before sowing. 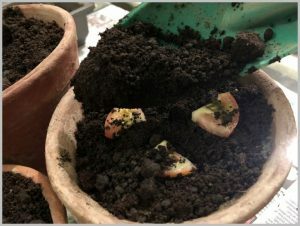 Fill the terracotta pots with seed-starting mix, leaving 1″ at the top. 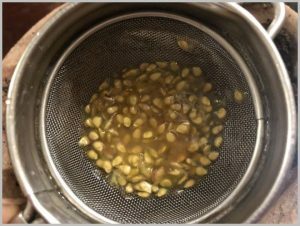 Sprinkle the seeds, pulp & slices. 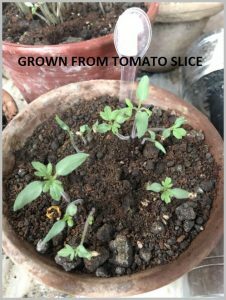 Place the slices apart so that seedlings do not get crowded while growing. 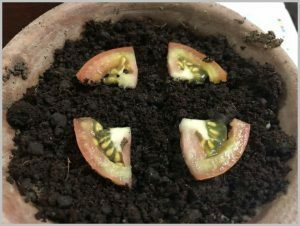 Keeping a tomato slice intact will cause too many seedlings to grow at a single place. It is better to split them according to space. 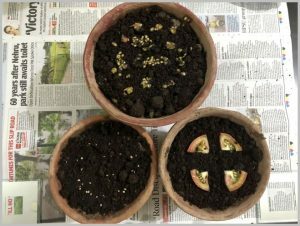 Cover the seeds with some compost and water thoroughly. Make sure the containers have drainage holes for excess water. 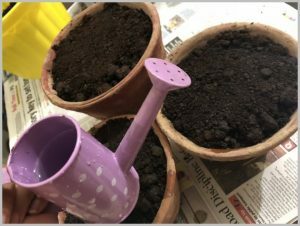 Some seeds may get exposed after watering. Cover them with more compost. Label the seeds with name & date. I use these disposable spoons and stick a sticker from the back to make it more visible. You could use the white ones too. Now keep them at a shaded spot (not direct sunlight) outdoors & wait for germination. Water the seeds once everyday but make sure the water drains away. The compost will help keep them damp. 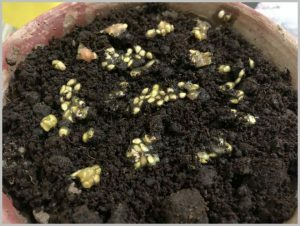 Germination begins after 7 days in all 3 pots. 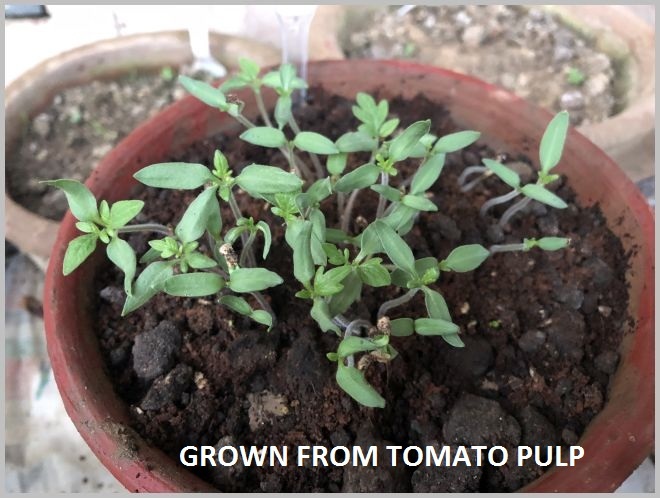 The tomato pulp has maximum while commercial seeds have least. It may be because the seeds were old. AND SOME MORE.. While fresh seeds from a packet would have done better, it is very clear that using tomato pulp or slice is an equally good method. Hence, you do not need to buy seeds. Also, taking one slice or only the pulp does not spoil the tomato and you can still use it for cooking. No wastage! If you do not split the tomato slice, the seedlings end up clustered like this. You can always separate them after they have grown but this will lead to more wastage while thinning. 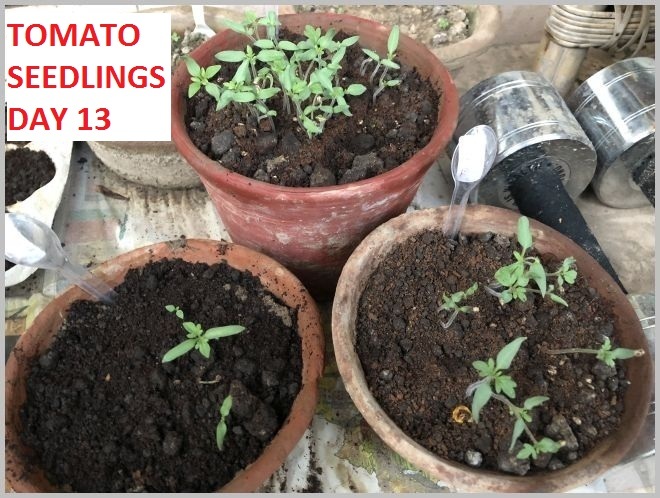 Wait till the seedlings are almost this size before moving into pots or ground. It will reduce the chance of them dying while transplanting. 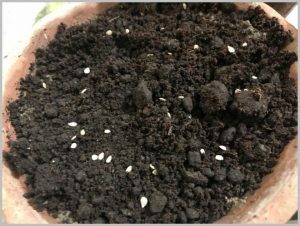 You can also add some Epsom Salt to move seedlings without killing them. Read about it HERE. 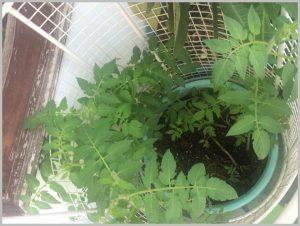 Support the tomato plants with sticks, against a wall/fence or inside a cage where they can spread freely without falling over. 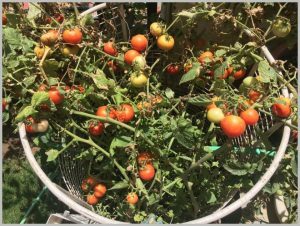 I have a special wrought iron tomato cage customized for this purpose. It works well in both ground & large containers. Last year’s first harvest. 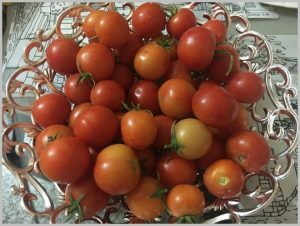 Fresh, healthy home-grown tomatoes. 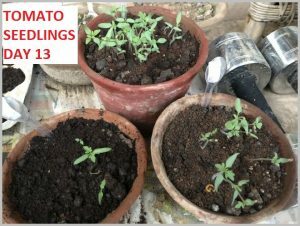 Hope this tutorial helped and inspired you to grow tomatoes in your own kitchen garden. Do share you experiences & tips!